Where can we buy vegan food for our cat? This was a very weird question we recieved, but we still looked for it, but we are kind of disagree with this. Cats need meat and protein to survive, but seems as it is now possible to put them on a vegan diet. This essential protein with amino-acidic chain can now be reproduced without using meat, where it is normally present in the muscular tissue. The absence of Taurine in cats’ diets can lead to serious diseases and/or death. 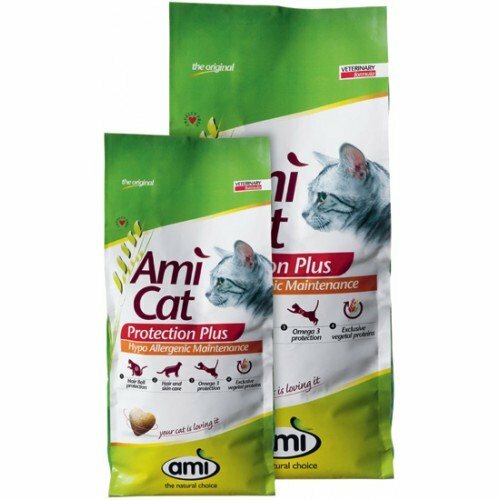 Its presence in Ami Cat, together with the natural and healthy ingredients that characterize the product, keeps your cats in good health and fine shape. In addition to Taurine, Ami food contains other essential nutrients that cats require including preformed Vitamin A and Arachidonic Acid as well as B Vitamins and other Amino Acids. The Ingredients in this vegan cat food are Corn gluten, corn, corn oil, rice protein, peas, peas fibre, brewer’s yeast, linseed, potato protein extract, vitamins and minerals, taurine (0.15%), L-Carnitine, Vitamin E. Linoleic acid (6.4%) [100% Vegetable Sources of Italian Origin] Nutritional additives: vitamin A 27.500 IU/kg, vitamin D3 1.600 IU/kg, vitamin E 270 mg/kg, copper sulphate pentahydrate (copper)10 mg/kg, iron carbonate(iron) 186 mg/kg, calcium iodate, anhydrous (iodine) 4 mg/kg, sodium selenite (selenium) 10 mg/kg, zinc oxide (zinc)100 mg/kg, manganous oxide (manganese) 12 mg/kg,taurine 1.500 mg/kg,L-carnitine 300 mg/kg. These ingredients make the cat food as good as any other food. Or at least that is how it is advertised. It is also very well reviewed on Amazon, four out of five stars, and seems the cats enjoy eating this cat food. Buy it at your own risk, but if you notice your cat has lost its vitality, please, bring it back to a normal cat diet. This entry was posted in Anything else and tagged allergic cats, ami cat, cat food, protection plus, vegan cat food, vegan cats, vegetable food on June 17, 2015 by WhereCanWeBuy.